Palisades at Sierra Del Oro is here to elevate your everyday from ordinary to extraordinary. Offering spacious one, two, and three bedroom apartments for rent in Corona, California, our homes are tastefully designed to appeal to your need for luxury. It starts with a Spanish Colonial style that is imbued throughout our property. Experience the beauty of the sunrise from your private patio or balcony, included with select homes. Dine al fresco with friends in one of our many beautifully landscaped common areas complete with outdoor barbeque. We have even equipped our apartments with convenient flat-panel television connections to accommodate your HDTV. 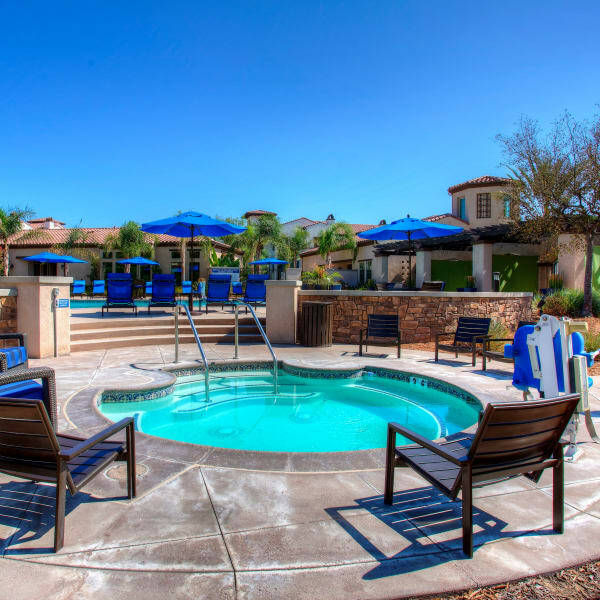 The community amenities at Palisades Sierra Del Oro are designed to inspire you to live the life you deserve. Relax next to the pool, soaking in the sun on a warm summer afternoon. Work away the stress of your day in the state-of-the-art fitness center complete with yoga and stretching stations. We also offer a Tot Lot for your children to run and play without ever having to leave home. There’s more to life at Palisades Sierra Del Oro. Learn more with a personal tour.